Mama Loves the Beach! : Mountain Lions Live Among Us . . .
"FYI, we stayed at Bodega Sand Dunes Campground Friday night and had a frightening close call with a mountain lion at 3:15 AM. After feeding the baby my wife left to visit the restroom without a flashlight. She had onlt taken a couple of steps when a cougar "screamed" at her no more than 25 feet away (sounded like less than 10). She froze and it screamed at her again. To me it sounded like a warning to stay away - a very scary warning that sends shivers down your spine. I called out to my wife who unfroze and dashed back into the tent. We were escorted out of the site as we were quite shaken. I wasn't overly concerned for the safety of my wife and I, but know that small children may be in danger so we left. I am an avid outdoorsman and have been my entire life (first backpacking trip at 6 months old), but those screams at my wife are still haunting. Best I can tell is the cougar was stalking a deer that was walking through our campsite. The cougar was down wind of us and deer footprints went right by our tent the opposite direction. My wife unwittingly opened the tent door and started walking towards its hiding place that wasn't far away and sent the warning screams at my wife. I have always wanted to see a cougar, but hope the next one we see uses better manners and says "please" and "thank you." :) We love the area and will be back again (just at a less remote camp site). Nice to know it is even more natural than I anticipated with even Mt. Lions." After reading this I immediately contacted two people whose knowledge and professionalism I greatly respect. They are professional tracker, Jim Sullivan, and 'The Felidae Conservation Fund' Founder, Zara McDonald. I will write a follow up post featuring comments and tracking information from Jim Sullivan. Zara McDonald is the author of today's guest post. "For many people, it can be disconcerting to realize that the beautiful wildlands we so enjoy around the Bay Area also serve as habitat for mountain lions (also called pumas or cougars). After all, the mountain lion is a fierce killer that can eat a human for dinner without a second thought, right? Well not exactly. The last time someone was killed by a mountain lion in the Bay Area was over 100 years ago, and it wasn't as a meal (a bite from a lion resulted in rabies). Though rarely seen, mountain lions live among us, and if we were on their menu, a lot more of us would be ending up as lunch." "Lions prefer to move and live in the wildest landscapes where their natural prey is abundant, but development and fragmentation of habitat has changed movement and dispersal patterns in lions. So we are seeing them more than was typical in the past." "The Bay Area Puma Project (www.bapp.org) is working to change the fearful perception of mountain lions. The project partners are working hard to get the word out that the mountain lion is very rarely a danger to humans." "Mountain lions are a ethereal animal that plays a critical role at the top of the food chain and are a keystone species in our local ecosystems. The mountain lions presence in the habitat is essential for maintaining the health and balance of the natural world we so enjoy. (Their mere presence lowers the risk of deseases such as lyme disease because lions feed on deseased and weakened prey)." "The Bay Area Puma Project was created because rapid human development in the region is threatening the very existence of healthy puma populations, and if we lose them, the health of our environment will go into decline. We urgently need to change this course, and find healthy ways for humans to co-exist with pumas, and all wildlife." "The Puma Project has already fitted 26 cats with tracking collars in the Santa Cruz Mountains, including 4 puma kittens, and is currently expanding the research to the East Bay and North Bay. 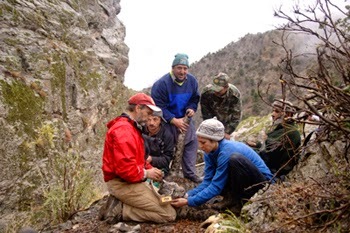 More information about mountain lions, as well as a list of upcoming talks and events, can be found at Felidae's website: www.FelidaeFund.org". I asked Zara, "What inspired you to establish 'The Felidae Conservation Fund?" "I was done with pre med and was moving away from medical school plans toward wildlife ecology, with a special interest in the role wild felids play in the ecosystem. I was an ultra marathoner at the time and had 2 separate sightings at the end of long runs, one very close, within 6 months of each other, in the Marin headlands. This was about 8 or 9 years ago. A lion’s head popped out of the riparian at eye level to me and about 5 feet away. I stopped running and we stared each other down. I was struck by the beauty of the animal and how natural it looked in the landscape. It seemed to look right through me. I felt like an intruder, and although I was scared, I knew he was going to walk away, and 15 seconds later he turned and left as quickly as he appeared. My life was changed from that moment on, in a powerful, and at the same time a subtle way that grew as time passed. The memory haunted me, and I held it close. Yet I knew I needed to do more. It seemed to fit well with my direction and over the next 2 years with encouragement from friends and colleagues, I started Felidae. Our mission is to advance the awareness and conservation of wild felids and their habitats all over the world." Thank you Zara for generously giving your time and information, and for your critical work in saving big cats the world over.